Highlighting a rift between the rich countries and emerging economies like China, New Zealand's climate minister staunchly defended his government's decision to drop out of the emissions pact for developed nations, saying it's an outdated and insufficient response to global warming. Other key issues at the conference, now starting its second week, include how to help emerging nations switch to climate-friendly energy sources and charting the course for a new treaty that would replace the Kyoto Protocol, which covers only developed countries. New Zealand announced before the U.N.'s climate talks started here last week that it would not take part in the second phase of the Kyoto treaty. That angered climate activists and stunned small neighboring island nations, who fear they could be submerged by rising sea levels spurred by global warming. Climate Minister Tim Groser told The Associated Press on Sunday that New Zealand is "ahead of the curve" by shifting its attention from the 1997 Kyoto deal to a new global climate pact that would also include developing nations. The U.S. never ratified Kyoto, which expires this year, partly because it did not impose limits on China and other emerging economies. Australia and European countries want to extend the pact at the current conference in Doha until a wider treaty comes into force. That is not scheduled to happen until 2020. Groser didn't see a point in that, because those countries together represent less than 15 percent of global emissions. "You cannot seriously argue you are dealing with climate change unless you start to tackle the 85 percent of emissions that are outside (Kyoto)," Groser said. "We're looking beyond Kyoto now to where we think the real game is." A majority of emissions of heat-trapping gases that most climate scientists blame for rising global temperatures currently come from developing countries, and China is now the world's top emitter. Beijing argues it must be allowed to increase its emissions as it economy expands, lifting millions of people out of poverty. It also insists that Western nations bear a historical responsibility for climate change, since their fossil fuel factories spewed emissions into the atmosphere long before China started industrializing. China therefore wants to retain the sharp division between rich and poor countries that has guided the slow-moving climate talks since they started two decades ago. Rich countries want to get rid of that distinction, which they say doesn't reflect the world today. New Zealand is on course to meet its Kyoto targets from the first commitment period, but climate activists at home and abroad say its decision to opt out of the extension has tarnished its reputation as a green leader. "New Zealand's position is contributing to a political stalemate that is distracting from the real issues of these talks," said Simon Tapp from the New Zealand Youth Delegation. Instead of binding Kyoto targets, New Zealand has offered a voluntary pledge of cutting emissions by between 10 percent and 20 percent by 2020, compared to 1990 levels. Groser said New Zealand wouldn't firm up its pledge until after the Doha talks. The country wants to know if it can continue using Kyoto's trading mechanism for emissions credits, which some countries say should be available only to those that set emissions targets. "I have advised my Cabinet, literally I've said to them, 'assume minimum rationally will prevail,'" Groser said. "Then I will come back after this meeting here and make a recommendation as to what unilateral figure we can do." 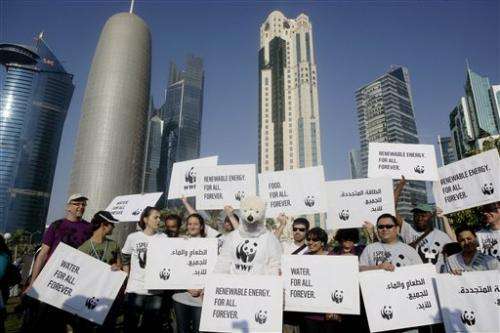 Negotiators in Doha are also locked in disputes over how to help poor countries switch to renewable energy and adapt to shifts in climate that may damage health, agriculture and economies in general. China and other developing countries demand that rich countries present a "road map" describing how they will scale up climate financing to $100 billion annually by 2020, a pledge they made at a climate summit in Copenhagen three years ago. With budgets under pressure from the world financial crisis, rich countries are unwilling to put money on the table in Doha, but they say such financing will become available eventually. They note that they have delivered the $30 billion promised as "fast-start financing" in Copenhagen, though some aid groups say much of it came from loans or previously pledged foreign aid simply relabeled as climate money. As many of these issues are linked to each other, failure to agree on one could stall progress on others, meaning the Doha talks could end without agreement on anything. The core climate problem is also receiving attention, and the conclusion is not positive. A host of reports before and during the talks have underlined that the gap between what science indicates is needed to address climate change and what governments are actually doing is growing wider. One report, by the United Nations Environment Program, showed greenhouse emissions have risen 20 percent since 2000. "We begin the final week of negotiations in Doha with the sober recognition that time is running out to prevent the loss of entire nations and other calamities in our membership and around the world," a group of small island nations said in a joint statement Sunday. Climate totem: Has Kyoto run its course? "The U.S. never ratified Kyoto, which expires this year, partly because it did not impose limits on China and other emerging economies." Ask not what the world can do for you but what you can do for the world. Please, US, it's time to join. We can't do it without you and the rest will follow eventually. Kyoto's carbon trading was never more than a scheme to redistribute resources. The whole AGW issue is focused on redistribution of wealth. One report, by the United Nations Environment Program, showed greenhouse emissions have risen 20 percent since 2000. But everyone is implored to do more of the same. New Zealand, you made a good decision to drop out of the emissions pact. Your decision to try to continue carbon trading, however, is confusing. World population rose about 17% during that time, mostly in Africa, the Middle East, and parts of Asia, meanwhile nations which were trapped in the dark ages at least attempted to modernize. Both of these factors combined explain 20% easily. It's actually shocking that the number isn't much larger.